Rift is a top quality free MMORPG developed by Trion Worlds and was generally acclaimed for its many qualities, including the vast game world and the high polish that was incomparable at launch. Players usually refer to Rift as the best free alternative to World of Warcraft, not only due to the lavish fantasy world with so much to do but also due to the ease that players feel at home with this game. Although it doesn't bring any kind of revolution to the genre, the Rift dynamic events are enough to surprise players and keep them coming back for more. 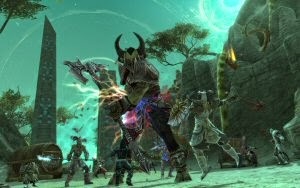 Rift is one of the current top MMORPGs out there, alongside Tera Rising or Dragon Nest.